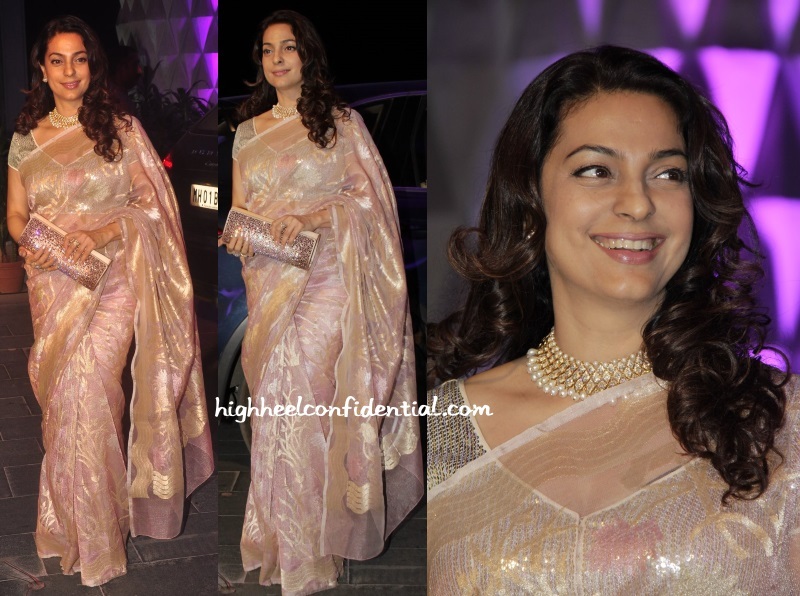 I can’t remember the last time we saw Juhi in a sari which is probably why at first glance I almost liked this appearance of hers in the beautiful Chanderi sari. I say almost because while I love the sari, where she went wrong was with the choice of blouse. I would’ve taken a cream blouse or for that matter even a solid colored one. Anything but the sequin one that she had on. Between the sari, blouse and the clutch, there was just too much bling. 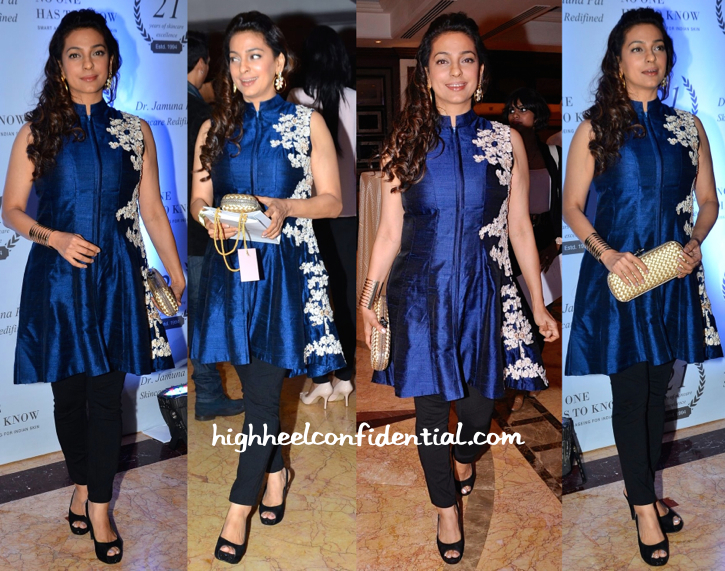 A recent book launch had Juhi Chawla in attendance who for the occasion paired her Ridhi Mehra tunic with black pants. Wearing her hair side-swept, she finished out the look with statement earrings, a wide cuff, black slingbacks and a Bottega Veneta stretch knot clutch. This look comes as quite a surprise given Ms. Chawla’s past few appearances on these pages! And while it (the look) wasn’t perfect, if it means she is trying something new, we sure look forward to seeing what’s next. 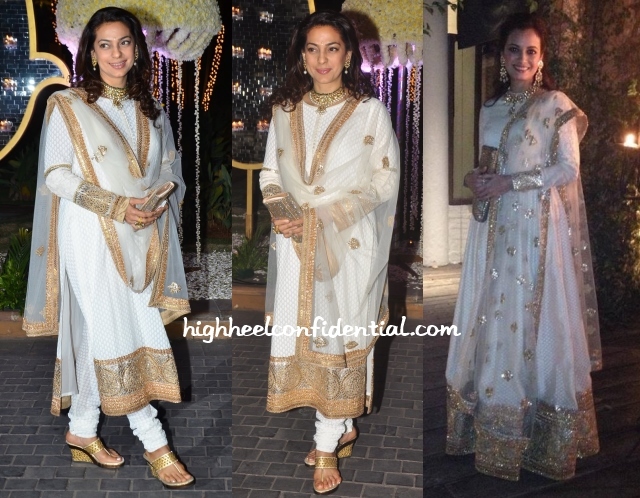 Wearing a Sabyasachi suit, Juhi attended recent wedding festivities held in Mumbai. Gold jewelry, matching metallic wedges and a sparkly clutch finished out her look. Wish she had skipped the necklace (which makes the kurta look high-necked) in favor of just big earrings. That and braided hair would’ve elevated this look! Dia too gave us a sighting of white and gold Sabyasachi not too long ago. Matching jewelry and sparkly clutch finished out her look as well. Now on her, we wouldn’t change a thing. She looked lovely! Juhi attended a bridal exhibition in Ahmedabad wearing an aqua blue Kunal Anil Tanna anarkali with Mayyur Girotra earrings. Maybe it’s the cheery color that is making me like this look on her a lot. Two different events saw Ms. Chawla in totally different desi looks, a pink Sabyasachi and a blue Manish Malhotra. Of the two, much preferred her in the pink. The blue floor-length kurta was nice but the skin-colored sleeves look rather odd.